I’ve looked at all matches that went to extra time or penalties in the World Cup, European Championships, Copa America, Africa Cup of Nations and Gold Cup, as well as Champions League/European Cup and Europa League/UEFA Cup finals that meet this criteria. In doing so I’ve largely avoided complications of home advantage or the away goals rule. In all, there were 102 games where a team equalised in normal time to send the game to extra time (or eventually penalties), and a further six matches had equalisers in extra time*. What we want to know, therefore, is whether the team that scores the final equaliser in normal time (e.g. Real Madrid against Atletico in the Champions League final, or Arsenal against Hull in the FA Cup final) has a better than 50/50 chance of winning the game on the basis of having the momentum going into extra time. The table below suggests not, with this team winning 52% of the time – not significantly different from 50%. Of course, not all equalisers are the same. A team that scores the final equaliser in the 10th minute is likely to have much less momentum than a team scoring the final equaliser in the 90th minute. 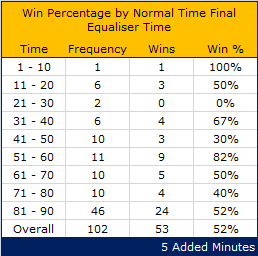 However, in the sample of games I’ve examined, there’s no noticeable effect of equalising late on win percentage. Teams equalising for the final time in the final ten minutes have gone on to win 24 of 46 matches, or 52% of games. All this is based on a few assumptions. Firstly, that across the 100+ games, the odds on either team winning after normal time is 50/50 on average. This plainly isn’t always the case; for instance Arsenal, and to a slightly lesser extent Real Madrid, were clear favourites going into extra time in their recent cup finals. It may be that after controlling for the strength of the teams there is some effect from scoring a late equaliser going into extra time. Equally, momentum – in terms of how fans intuitively sense it – isn’t entirely governed by goals; red cards, missed penalties, missed chances and sustained pressure can also change the ‘mood’ of a game, often away from the team who scored the final equaliser. People are beginning to quantify this, too, as it’s a little simplistic to derive all momentum from an event as rare as goals. That said, backing a team going into extra time purely on the basis of them having scored a late equaliser in normal time isn’t a winning strategy – we just tend to selectively remember the 52% of the time teams actually do convert momentum from goals into victories. ← Going Behind: Was there a warning sign for Manchester United?